Be honest, have you ever been tempted to quit photography as a profession? You’ve heard the old saying that the camera doesn’t lie (okay, it can lie quite a bit, but that’s a whole different story), but someone has been lying to you nonetheless. And, yes, it could very well be you. In this case, it’s about marketing your photography and getting the clients you deserve. Or, more likely, not getting enough clients or customers. Business is tough right now, and it seems like everyone and their dog calls themselves a professional photographer for no other reason than they have a “good” camera and their friends and family constantly tell them they “make nice pictures and should start a photo business”. No wonder so many talented professionals are thinking of giving up photography altogether! But how has business been for you over the last 12 months? Slow or hard going, perhaps? Does it feel like you’re getting nowhere fast, spinning your wheels as you watch other less-talented photographers steal your clients right from under your nose? In fact, the only person you should be worried about is you because you have zero control over the other photographers. If you’re stuck right now, there’s a good chance you’ve been telling yourself a bunch of lies about marketing. Lies that can seriously cripple your business, and cause you to become just another failed photographer. It’s tempting to think you just need to get more exposure, but this can run you into the ground and still leave you invisible. The result? You end up having to quit photography through lack of money. At some point, I bet you’ve heard from someone wanting to hire you for a job who thought they could get away with asking you to do it free or at an insanely cheap rate. It usually comes with a vague promise of a ton of “exposure”, as if that would somehow magically lead to a deluge of new photography clients. Exposure (aka “getting your name out there”) is NOT the same as marketing. The only thing exposure will achieve is to put your photography in front of a bunch of people who aren’t even thinking about hiring a photographer at that moment. Two minutes later, they’ve forgotten you ever existed. Sadly, if you’re working like mad just to get more “exposure”, you could in fact be killing your business by failing to work on the things you should be doing! In fact, the only “exposure” you need more of is the kind that happens when you take a photograph. You certainly can’t pay your bills or run a studio on “exposure”—you need actual money for those things. Run out of money and guess what? You really will be forced to quit photography as your business. People in your city aren’t as different as you might think they are. Too many photographers quit photography because they fall for the lie that no one in their location can afford (or want) their services. Are the folks in your town from the planet Mars, or do you live in the fictional town of Stepford where everyone behaves like a robot? Are YOU somehow fundamentally different to the people here in Memphis, London, Chicago, or Los Angeles? Yes, there are cultural differences across parts of the world, but those aren’t enough to significantly alter people’s behavior when it comes to investing in great photography. You might think you live in the poorest part of your country or state, and that no one can afford to buy photography. Newsflash: everyone else thinks that too. Sorry, but you can’t all be right. The fact is, there are rich folk and poor people everywhere you go, along with everyone in between. But that’s not even the big issue here. Who cares if your photography customers are rich or poor? The most important thing (at least as far as your marketing goes) is that they love you and what you do. If you can’t communicate through your marketing who you are and why people should hire you, it won’t matter how much money they have to spend on a photographer because you haven’t made them care enough to want you. Word of mouth marketing is great marketing, and it’s free, but to get it you first need to have clients who love you. To get those, you have to do some real marketing! Remember, no clients = no business = having to quit photography! There’s no doubt that effective word of mouth marketing is awesome. But there’s something you need before that can happen. But how do you propose to get all those ecstatic folks without doing some real marketing first? 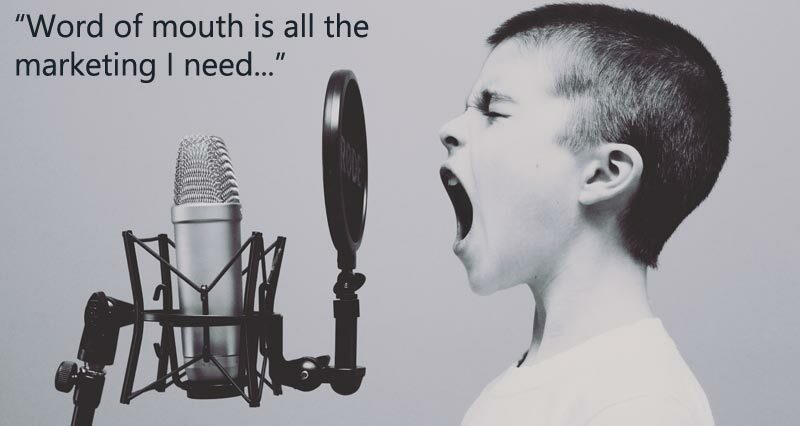 Even then, you need a LOT of them to make word of mouth work for you well enough to keep you busy through that channel alone. Time and time again I see photographers default to word of mouth as their preferred marketing vehicle because it protects them from what they see as the pushy side of having to market and sell their services. Sorry, but there’s no escaping the need to market and sell your photography. It’s what running a business is all about because a business can only survive on money, which can only come from making sales or booking clients. Obviously, you shouldn’t ignore the amazing credibility your clients have when talking about you, so it’s important to know how to get testimonials from those people who loved working with you so you can use them in your marketing materials. If you think hiring an SEO company is going to fix everything and get you a ton of visitors from Google, think again… More than a few photographers have ended up having to give up photography because they were bankrupted by unscrupulous SEO firms. How much do you rely on Google to send potential clients to your website? For some photographers, being found in the search results is the only serious marketing they’re prepared to do, but it’s a minefield and not as effective as it used to be. I see photographers worrying themselves to death over search engine optimization (SEO) and freaking out every time Google changes something. How often have you found yourself getting stressed out just trying to get Google to notice you exist? I bet you’ve also received those tempting-sounding emails from SEO firms promising you a number one spot. The vast majority of those companies are little more than a legalised scam, and they charge a fortune. Nothing is more guaranteed to make you want to give up photography as a business than running out of money altogether! Yes, they might be able to pull the wool over Google’s eyes for a short time by using some black hat SEO techniques, but it won’t last and you run the severe risk of being penalized when Google finds out (and they will). Yes, being found in the search results is important, and SEO is something you should be doing, but it’s not rocket science and you can find all you need to know about it in my SEO For Photographers Made Simple guide. Don’t end up with a dead business and be forced to quit photography because you fell for the lie that photography sells itself because it simply doesn’t. I honestly wish this one were true! All you would need to do is build a basic website and blog, put a slideshow on the front page, add a few galleries and portfolios, post some sneak peeks on Facebook, and write blog posts filled with little more than photographs. Who needs words in a world where the photographs do all the selling? Wait a minute, doesn’t that marketing picture I just painted look awfully similar to what a lot of photographers are actually doing right now? Yikes, I really hope your marketing hasn’t fallen into that trap! Like it or not, and I know you probably don’t love it, but it’s essential for you as a marketer of photography to embrace the art of writing. Your photographs might have stories to tell but I guarantee your potential clients are not hearing those stories if all you do is show them the photos without the words. I’m sure you feel like I just asked you to eat worms for breakfast, but writing is really that important! On the bright side, you don’t have to be a great writer (or even technically brilliant at it) to make your marketing work. All you need to do is put down the words you would naturally use when talking to someone in person. A lot like what I’m doing right now. You should at least give it a try because it can’t make things any worse, can it? Because, no matter what you believe photography really doesn’t sell itself. This particular lie has killed more photography businesses than I can count. Not a week goes by without me getting embroiled in a heated discussion with a photographer about their website design. Perhaps you’re thinking about giving your website and blog a makeover. You know, to make things pop, or better communicate your brand. Photographers fail for so many reasons, but this is one of the worst, because it’s so unnecessary. I beg you, if you’re thinking of redoing your website, don’t fall for the vicious lie that design is more important than functionality! You’re a business owner, not an amateur photographer who wants to show off some photographs, right? In that case, build your website with its business functions in mind first, and then backed up with a pleasing design (no one says your website has to be ugly to make this work). Sorry to disappoint but the photography business is not much different to other similar service-based industries. If you have to quit photography because you bought into the lie that you need unique marketing techniques, what a shame that would be, right? Granted, it might differ from the oil industry or car manufacturing, but it’s really not much different to many other personal-service businesses, specializing in custom or discretionary offerings. What do you actually do when looked at from a fundamental level? Chances are you provide a 1-to-1 service, tailored to the needs and desires of each specific client, and you do so at a premium rate commensurate with the skills you bring to bear on the project. There are lots of other businesses with similar business models, such as high-end hairdressers, interior decorators, make-up artists, wedding planners, pet groomers, image consultants, attorneys, chiropractors, dentists, veterinarians, the list goes on. For sure, the one thing you are NOT providing is a commodity. People can’t buy your photography at Walmart, in the supermarket, or off Craigslist (if they can, you’re possibly in the wrong place). If you believe the lie that marketing photography requires some kind of unique methodology that doesn’t apply elsewhere, then you’re most likely heading for trouble. Instead of looking for the one big photography marketing secret (it doesn’t exist), adopt a proven system of lead-generation to attract the right people, connect with them in a meaningful way, and then convert them into leads you can turn into clients. Not sure what that looks like? I show you exactly how, step-by-step, in my Get More Photography Clients photography marketing course. Don’t be tricked into working for “exposure”. It’s not real, and you can’t pay the bills with it!